Refractory anemia with ring sideroblasts (RARS), a clonal hematopoietic neoplasm, is a low-grade MDS characterized by anemia, bone marrow erythrodysplasia, and ring sideroblasts; ring sideroblasts represent 15% or more of nucleated erythroid precursors. RARS is associated with an increase in the risk of progression to overt acute myeloid leukemia (AML), as well as shortened overall survival, although these risks are not as great as with MDS of higher grades. See the image below. The presence of ring sideroblasts alone is not sufficient for a diagnosis of RARS; complete evaluation of the nonerythroid lineages is necessary. Dysplasia in the granulocytic and megakaryocytic lineages is not present in RARS. Myeloblasts account for fewer than 5% of nucleated bone marrow cells, and Auer rods are absent. See Pathology of Refractory Anemia with Excess Blasts, Chronic Anemia, Chronic Pediatric Anemia, and Emergent Management of Acute Anemia for complete information on these topics. The epidemiologic features of refractory anemia with ring sideroblasts (RARS) are similar to those of most other types of myelodysplastic syndrome (MDS). The average age of patients at presentation is approximately 65-70 years. MDS, which is uncommon in the pediatric population, is most often associated with inheritable genetic syndromes and rarely presents as RARS. Clinical features of the syndrome are nonspecific (eg, fatigue) and can be attributed to anemia associated with ineffective erythropoiesis. 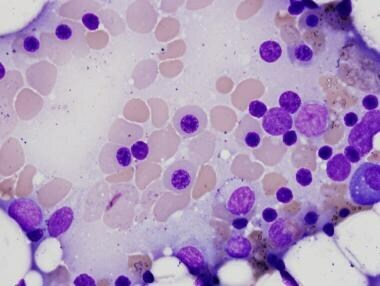 The morphologic features of the peripheral blood and bone marrow are currently the gold standard for the diagnosis of myelodysplastic syndrome (MDS). 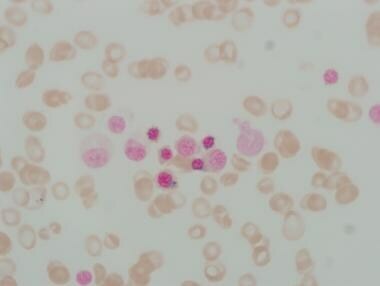 The peripheral blood shows a macrocytic or normocytic anemia (hemoglobin level < 10 g/dL) with anisocytosis. Although dysplasia is limited to the erythroid precursors, neutropenia or thrombocytopenia may be present. Most often, the bone marrow is hypercellular with a significant increase in erythroid precursors. At least 10% of the erythroid lineage shows 1 or more of the dysplastic features (listed below). The granulocyte and megakaryocyte maturation is morphologically preserved. Ring sideroblasts (see the images below) represent at least 15% of the nucleated erythroid precursors. Cases demonstrating Auer rods and/or increased myeloblasts (>5% in bone marrow) are not included in this group of disorders (see Refractory Anemia with Excess Blasts). As with all forms of MDS, other causes of myeloid dyspoiesis should be excluded before this diagnosis is assigned. Cells are disproportionately large, corresponding to the normal stage of development (see the images below). Nuclear atypia includes binucleation and nuclear fragmentation/karyorrhexis. 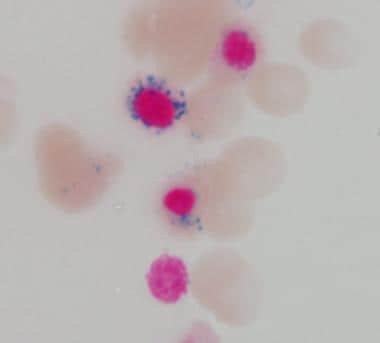 Single or multiple cytoplasmic vacuoles are present; on periodic acid-Schiff (PAS) staining, the cytoplasm demonstrates clumped or block like morphology. In contrast to normally maturing precursors with finely granular cytoplasmic morphology seen with PAS staining, severely dysplastic red cells show clumped cytoplasmic morphology. Erythroid hyperplasia and cytoplasmic vacuolization. Erythroid precursor with nuclear blebbing. Ring sideroblasts, defined as nucleated erythroid precursors with 5 iron granules or fewer surrounding at least one third of the nucleus, represent 15% or more of the erythroid lineage. Ring sideroblasts may be evaluated by use of commonly available iron preparations (eg, Prussian blue stain). Although ring sideroblasts are not distinguishable without appropriate iron stains, increased numbers of hemosiderin-laden macrophages can be appreciated by conventional staining methods (eg, Giemsa staining). 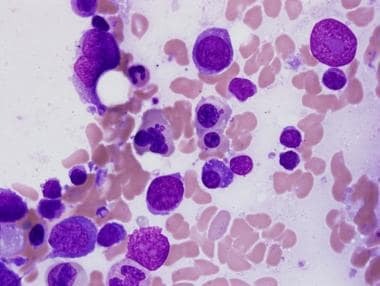 Findings of increased numbers of myeloblasts (>5%), the presence of Auer rods, and dysplasia of nonerythroid progenitors are not consistent with a diagnosis of refractory anemia with ring sideroblasts (RARS); cases with these features are more appropriately classified into other categories of MDS. Morphologic changes identical to those of bona fide erythrodysplasia may occur as artifacts of poor preservation or inadequate storage of samples during transport; extra caution is advised when evaluating suboptimal specimens. 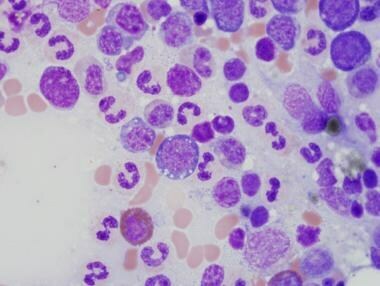 Although not entirely specific for myelodysplasia, the presence of ring sideroblasts is necessary for the diagnosis of RARS; they are less likely to occur as artifacts. Additionally, the presence of bone marrow hypoplasia does not exclude a diagnosis of this or any other MDS; hypoplastic forms are not uncommon in MDS, occurring in approximately 10% of confirmed cases. Common causes of acquired sideroblastic anemias, particularly alcohol- and drug- associated forms, should be excluded before a diagnosis of RARS is issued. The morphologic findings in RARS are not entirely specific, and both dyserythropoiesis and ring sideroblasts may be seen in a variety of acquired and inherited conditions., as listed below. Immunohistochemical studies are not necessary for the diagnosis of refractory anemia with ring sideroblasts (RARS), because in RARS, the morphologic features are paramount. Nevertheless, staining for CD34, a relatively specific marker of hematopoietic progenitors in bone marrow biopsy sections, may be used to exclude the presence of an increased number of blasts—a finding characteristic of forms of myelodysplastic syndrome (MDS) other than RARS, including refractory anemia with excess blasts (RAEB). However, one should keep in mind that not all myeloblasts express CD34; thus, although an increased percentage of CD34 cells would not be seen in RARS, an absence of CD34+ cells does not exclude a higher-grade MDS. Although chromosomal abnormalities are not diagnostic of RARS in isolation, they are prognostically significant. Accordingly, cytogenetic analysis of all bone marrow specimens should be performed. The IPSS separates patients into 4 risk groups (low, intermediate-1, intermediate-2, and high); the 4 groups represent increasing likelihood of progression to acute leukemia and decreasing survival. Scoring is based on the number and type of cytogenetic abnormality, the percentage of bone marrow blasts, and the number of peripheral blood cytopenias. The majority of patients who have been diagnosed as having RARS on the basis of the World Health Organization (WHO) criteria fall into the low and intermediate-1 risk groups. Brunning RD, Orazi A, Germing U, et al. Myelodysplastic syndromes. Swerdlow SH, Campo E, Harris NL, et al, eds. World Health Organization: Classification of Tumours of Haematopoietic and Lymphoid Tissues. 4th ed. Lyon, France: IARC Press; 2008. 5. Tehranchi R, Invernizzi R, Grandien A, Zhivotovsky B, Fadeel B, Forsblom AM, et al. Aberrant mitochondrial iron distribution and maturation arrest characterize early erythroid precursors in low-risk myelodysplastic syndromes. Blood. 2005 Jul 1. 106(1):247-53. [Medline]. Houwerzijl EJ, Pol HW, Blom NR, van der Want JJ, de Wolf JT, Vellenga E. Erythroid precursors from patients with low-risk myelodysplasia demonstrate ultrastructural features of enhanced autophagy of mitochondria. Leukemia. 2009 May. 23(5):886-91. [Medline]. Claessens YE, Bouscary D, Dupont JM, Picard F, Melle J, Gisselbrecht S, et al. In vitro proliferation and differentiation of erythroid progenitors from patients with myelodysplastic syndromes: evidence for Fas-dependent apoptosis. Blood. 2002 Mar 1. 99(5):1594-601. [Medline]. Germing U, Strupp C, Kuendgen A, Isa S, Knipp S, Hildebrandt B, et al. Prospective validation of the WHO proposals for the classification of myelodysplastic syndromes. Haematologica. 2006 Dec. 91(12):1596-604. [Medline]. Truong F, Smith BR, Stachurski D, Cerny J, Medeiros LJ, Woda BA, et al. The utility of flow cytometric immunophenotyping in cytopenic patients with a non-diagnostic bone marrow: a prospective study. Leuk Res. 2009 Aug. 33(8):1039-46. [Medline]. Della Porta MG, Malcovati L, Invernizzi R, Travaglino E, Pascutto C, Maffioli M, et al. Flow cytometry evaluation of erythroid dysplasia in patients with myelodysplastic syndrome. Leukemia. 2006 Apr. 20(4):549-55. [Medline]. Sole F, Espinet B, Sanz GF, Cervera J, Calasanz MJ, Luno E, et al. Incidence, characterization and prognostic significance of chromosomal abnormalities in 640 patients with primary myelodysplastic syndromes. Grupo Cooperativo Espanol de Citogenetica Hematologica. Br J Haematol. 2000 Feb. 108(2):346-56. [Medline]. Germing U, Gattermann N, Strupp C, Aivado M, Aul C. Validation of the WHO proposals for a new classification of primary myelodysplastic syndromes: a retrospective analysis of 1600 patients. Leuk Res. 2000 Dec. 24(12):983-92. [Medline]. Palmer SR, Tefferi A, Hanson CA, Steensma DP. Platelet count is an IPSS-independent risk factor predicting survival in refractory anaemia with ringed sideroblasts. Br J Haematol. 2008 Mar. 140(6):722-5. [Medline]. Park MJ, Kim HJ, Kim SH, Kim DH, Kim SJ, Jang JH, et al. Is International Prognostic Scoring System (IPSS) still standard in predicting prognosis in patients with myelodysplastic syndrome? External validation of the WHO Classification-Based Prognostic Scoring System (WPSS) and comparison with IPSS. Eur J Haematol. 2008 Nov. 81(5):364-73. [Medline]. Chee CE, Steensma DP, Wu W, Hanson CA, Tefferi A. Neither serum ferritin nor the number of red blood cell transfusions affect overall survival in refractory anemia with ringed sideroblasts. Am J Hematol. 2008 Aug. 83(8):611-3. [Medline].